This is my tenth year of campaigning for the Greens in Indi – and by far the most interesting. Usually there is no contest: Labor runs a well-meaning but no-chance candidate; I try to increase the Green vote – it’s risen from less than three percent in 2003 to almost 10% at the last election; Sophie Mirabella is a shoe-in. I have always run with the line that we should make Indi marginal but it seemed a mere pipe dream. 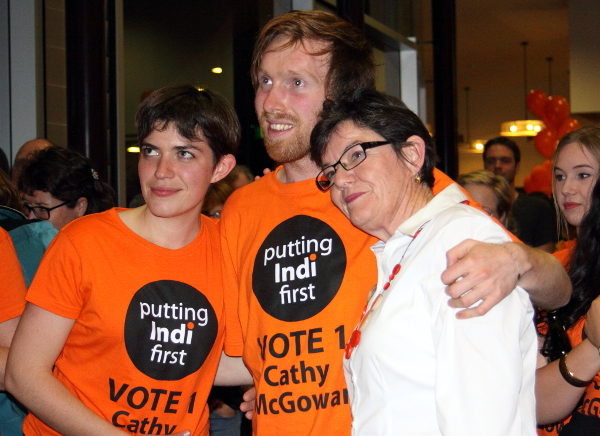 I first became aware of Voices for Indi – V4I – when some Green supporters started wearing the badges and talking about supporting Cathy McGowan. At this stage V4I stated they had no candidate and were going through a process of ‘kitchen table conversations’ to engage the electorate. I contacted them and spoke with Cathy to say that I wished them luck but also that hoped they would not split the Green vote, as it seemed it was Not Happy Sophie conservatives who would swing the outcome. Then the Orange People started appearing everywhere – T-shirts, badges, car stickers, posters – and my fears were realised when even paid-up members of the Greens said they were supporting McGowan as she was the best chance of removing Sophie. Then Tony Windsor made his Nasty Prize comment and endorsed Cathy. It was on. Indi attracted national media attention and interest, donations flowed in and suddenly the idea that there might be a real chance of unseating Mirabella took hold. People started telling me that this was the main game. The fact that Cathy was not taking a policy position on any of the issues that Green voters usually identify with did not matter at all – it was a case of Anyone But Sophie and Cathy was a genuinely better alternative. I became increasingly discouraged at this stage. Abbott and Rudd were outdoing each other on who could be the cruelest to asylum seekers, undoing any real attempt to reduce carbon emissions, and generally behaving like two rival school prefects in a boarding school house contest. None of this cut through in Indi. The fan club for Cathy had taken hold, and belonging was all that mattered. Seeing some usually dignified friends and neighbours wearing orange and V4I badges everywhere was a bit too weird for me. I don’t even wear the colour green during campaigns as I think it’s naff. Something was taking Indi to a whole new level not seen since the Bay City Rollers were a fad in the eighties. Then the candidate forums started. We had six in all, and we began to see real democracy in action. The candidates were an eclectic bunch: the experienced political hard hitter Mirabella, some minor party old boys and independents who had little of substance to offer, a very nervous and inexperienced Labor candidate and Cathy, who was determined to stay positive at all times even when under fire. “Thank you for that really great question” and “I’ll be consulting the people of Indi” were her stock responses. I was in my element at these forums, and the feedback was enthusiastic as I took on Sophie in no uncertain terms and challenged her repeatedly, winning lots of support from anti-Sophie voters and increasing derision from her supporters. Team McGowan were clearly racing ahead in leaps and bounds. I spoke to our preference team and suggested we give Cathy number 2 instead of running an open ticket as originally planned. 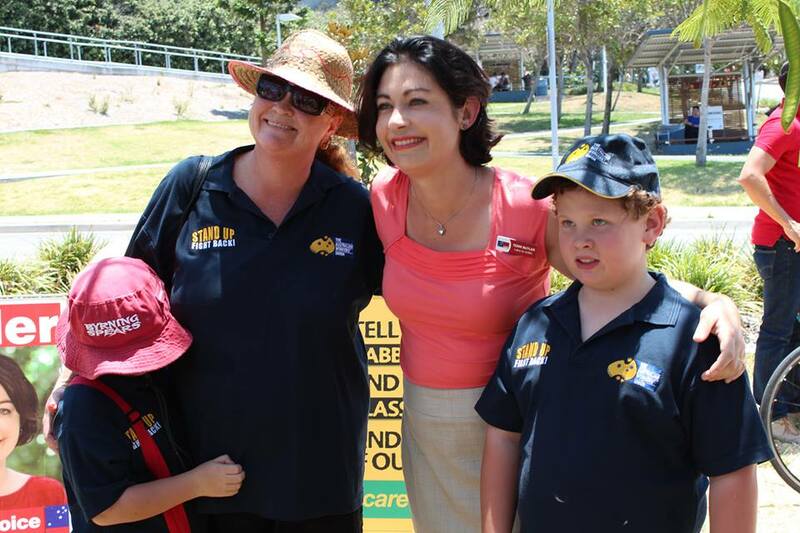 When Labor also preferenced her the contest hotted up even further and Sophie was clearly rattled. Suddenly Indi became the drop-in centre for senior Coalition figures Joe Hockey, Barnaby Joyce (an attempt, unsuccessfully, to play down the rumour that the Nationals in Indi were behind Cathy’s campaign), and both Labor and Libs started throwing money around like never before. Five million dollars for a cardiac unit, six million for upgrading Wodonga city centre, two million for roads. The benefits of becoming a marginal seat were already clear. So we are in the final week of the campaign. The contest is between Mirabella and McGowan and I am firmly supporting Cathy in the hope that we really can change this from a safe seat to the most interesting seat in Australia. The repercussions would reverberate across the nation if, at a time when the Coalition wins, one of its senior members gets tipped out for being too unpleasant for the people in her electorate to tolerate her any longer. Every politician in the country would be on notice to behave themselves and not forget who put them there in the first place. And even if Sophie is re elected she will have to watch herself. Indi will be seen as a possible win for all sides of politics, so the lolly will continue to be thrown around. 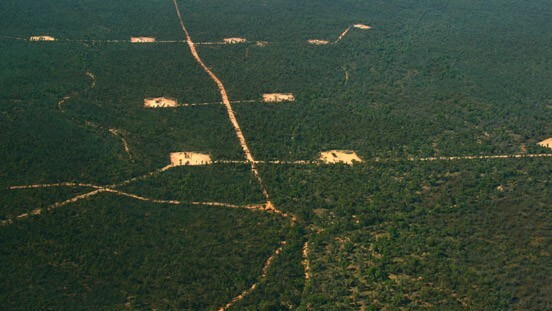 Whatever the outcome of this election the seat of Indi will never be seen as ‘safe’ again. As for the future of the Greens in Indi, I sincerely hope progressive voters remember the power they can have using preferences. I also hold out great hope that we will help to elect Janet Rice to the senate at this election, as many Cathy supporters have told me they are voting Green in the senate. And me, I say after every election that “I will never do that again”. Thank you for preferencing the Indi indie. Good luck. Whoever wins, let it not be the current sitting member who has been truly outstanding… in all the the wrong ways. Outstandingly unpleasant and haughty, treating people with disdain, and forgetting that being an MP is a privilege. So many independent voices have shown that safe seats are always vulnerable: Ted Mack in North Sydney, Peter Andren in Calare, Tony Windsor in New England and Rob Oakeshott in Lyne, Bob Katter in Kennedy, not forgetting Phil Cleary in my own seat of Wills in 93. Independents do deliver the goods to their electorate, even though major parties never admiit this. Adam Bandt has raised the safe seat of Melbourne to a marginal Green, Alex Bhathal for the Greens will give Labor’s David Feeney a run for his money in Batman, and Tim Read will probably finish second in Wills, reducing the 2 party preferred margin and the electoral contention between Labor and Green. Good luck to you Jenny, and the hope of getting a more responsive MP for Indi, and in getting Janet Rice elected to the senate. I have met her on two occasions during the campaign and she is a strong candidate worthy of support. Jenny , I have voted already, I have voted for Cathy, sorry, but due to your outstanding performance and true commitment and your unwavering belief in your party’s policies , I have voted greens in the Senate. P.S. I don’t always believe in the greens policies. Good Luck and hope to see you next time. Abbott has ruled out forming a minority government. Actually McGowan has committed to go with the popular vote in a hung parliament, not one party or another. If it was a hung parliament there is I would not support an Abbott-led Coalition. This is a very exciting contest. I’ve followed Sophie M’s progress since she argued during the 1999 referendum on the republic, that the Queen is not our head of state, the Governor-general is the head of state. She has a way with facts. Full marks to Jenny for attempting to raise federal policy during a federal election. Good luck! I have supported the Greens in Senate albeit going with Cathy in reps. Because Jenny O’Connor , you are a feisty, intelligent character!